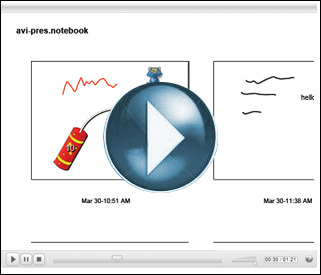 Quick overview: A step-by-step video tutorial on how to export your classroom SMART Notebook presentation as a PDF file. This allows your students to open your presentation on their home computers, even if they don’t have the SMART Notebook software installed. How does it work? By default, a SMART Notebook presentation is saved as a “.notebook” file. This type of file requires that you have the SMART Notebook software installed on your computer in order to re-open it. If you do not have the SMART Notebook software on your computer, it simply will not open. That being said, most of our students do not have the SMART Notebook software installed on their home computers and will be unable to open your presentation if you decide to share it with them. In order to share your SMART Notebook presentations with ALL your students, you need to export it as a PDF file. Advanced ICT Tip: Want to get really fancy? You can even embed additional attachments to your PDF file, such as a supplementary Word or Excel file. Open this example and click on the small paper clip icon next to the words “first derivative test” on the second page. You’ll notice there is a Word document attached that you can open up. If you’d like to know how to do this, please contact me. This entry was posted in IWB and tagged export notebook, export to pdf, notebook file, save notebook. Bookmark the permalink. « SMARTBoard: The SMART Exchange website allows you to search and download complete SMART Notebook lessons!